Home / Blog / EIA, breaking the news and making headlines in 2011! It’s the final EIA blog post of 2011, an ideal time to reflect on some of our major successes during the year. You could be forgiven for supposing that the thousands of news stories filling the airwaves and acres of newsprint throughout the year are largely the result of diligent news gatherers following up tip-offs and assembling evidence like so many white-collar private eyes – assuming you don’t imagine they all cut-and-paste from Wikipedia or hack into the nation’s mobile phones. The reality is that the vast majority of the legwork is done long before a story gets anywhere near a newsroom; many – perhaps most – off-diary stories are supplied as near-finished packages or very informed leads by organisations such as EIA. 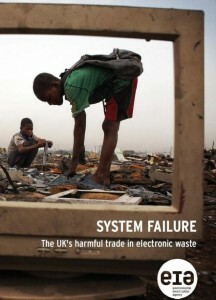 Our System Failure report was released in May and showed that the disposal of electronic waste (goods such as mobile phones, televisions, stereos, laptops, PCs and printers) is fast becoming such a big business that the chance to make a quick buck at the expense of the developing world has led to the creation of a highly lucrative international black market involving many players at every level, from small-time electronic brokers to large organisations, local councils and even major central Government institutions. The ultimate cost of this toxic trade is paid by countries such as Nigeria and Ghana, where our e-waste is crudely broken down with dire health consequences. BBC’s Panorama followed up on our findings for its programme Track My Trash, which can still view on BBC iplayer here. 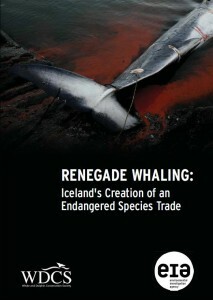 In July, our report Renegade Whaling revealed how Icelandic company Hvalur and its multi-millionaire boss Kristján Loftsson were hunting fin whales for export to Japan via a company he helped to set up. As a result of our exposé, Iceland was certified in the USA under the Pelly Amendment for diminishing the effectiveness of the International Whaling Commission, and President Barack Obama subsequently endorsed a range of diplomatic actions against the country to ensure its whaling activities remain under close scrutiny. 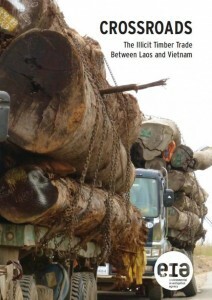 Also released in July, our Crossroads report, based on extensive field investigations between October 2010 and May 2011, highlighted the ongoing trade in round logs between Laos and Vietnam, despite a log export ban in the former. Perhaps the biggest revelation was the leading role by the Vietnam military, which owns the Vietnamese Company of Economic Cooperation (COECCO) – one of the biggest loggers active in Laos. Throughout the year, we have been pressing the Government of Norway to address serious conflicts of interest between its championing of the REDD+ initiative to stop rainforest loss and the investments of its Government Pension Fund Global (GPFG) in firms directly linked to forest clearance for palm oil plantations. Last month, a face-off in East Kalimantan threw the situation into sharp relief, with the villagers of Muara Tae caught up in a fraught confrontation with the bulldozers of a palm oil firm in which, it emerged, the GPFG has a financial interest. The story of Norway’s compromising investments was subsequently covered in The Guardian and elsewhere. Undercover investigations in Hong Kong and mainland China in March revealed a lot of new information about the ivory trade. Of particular concern were allegations made by some traders that the Chinese Government was effectively gaming the system; after securing approval as a buyer at CITES-approved auctions of stockpiled ivory, instead of using the ‘legitimate’ supply to undercut the black market in illegal ivory, it appears China was instead selling it on internally at a vast profit. These allegations form a key part of the new National Geographic documentary Blood Ivory Smugglers, which had its UK premiere last night (December 29) and is repeated on New Year’s Day at 10pm and on January 5 at 3pm. Those are just the tip of the iceberg in what’s been a highly productive and busy year for EIA, one in which we also played a key role in achieving a groundbreaking agreement on timber trade between the European Union and Indonesia, kept tabs on supermarket promises to get rid of greenhouse gases in their fridges and even found time to design and launch which a new website. For operational reasons, and especially for the safety of our investigators in the field, I can’t give too much away about the activities that we’ve got lined up for 2012; suffice it to say that we’ll certainly be following up on the above investigations while launching several new ones. Once again, thank-you all for the generous support throughout the year that’s helped us keep on doing what we do so well, and on behalf of the entire team at EIA, may I wish al our supporters everywhere a peaceful and happy new year.